Black cat: Lynx 01 features extra black lenses (darker in appearance than standard gray lenses) for a truly striking look. Polished black marble side inlays compliment the polished black acetate frame. A stunning new take on a classic: Lynx frames feature ultra-flat lenses in an upswept almond shape that flatters any face. We set out to create the perfect cat-eye using only the finest materials and best craftsmanship. Each frame is meticulously handmade in Japan and features high-quality shatterproof lenses with 100% UV protection. 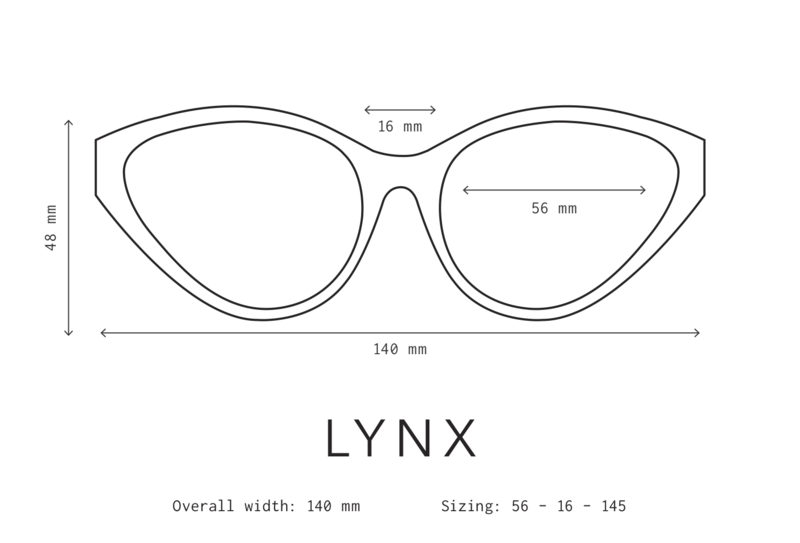 The Lynx shape was designed to be comfortable and flattering on all face shapes. Its wire-core temples are highly adjustable, and its super-durable construction and smooth, high-quality hinges ensure these will be your favorite shades for years to come. A modern take on the cat eye. Lynx is inspired by the namesake constellation which was discovered in the late 17th century, usually observed in the northern sky, and named after the fierce feline.